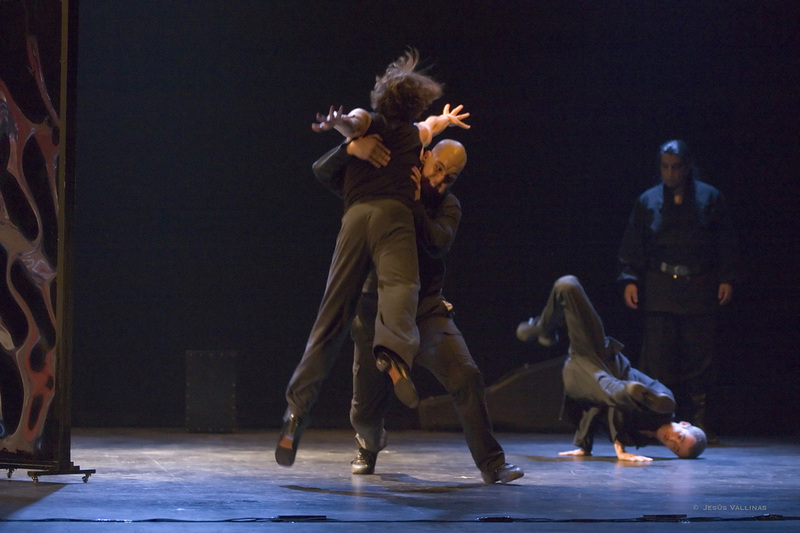 Visual adaptation of William Shakespeare's " OTELO ", using the choreographic language to situate it the spanish culture, more specifically, in the art of flamenco. Three principal characters are in the center of that tragedy, each of them represented by the three principal elements of the flamenco art: Desdémona is the melody, represented by female flamenco guitarist Carolina Planté, Othello is the voice, represented by the "cante más jondo" (deep singing) and by Luis López, prestigious malambo dancer that has been working with the Cirque du Soleil during many years and that also founded the group Malambo based in Québec, Canada and Iago is the percussion, represented by Cruceta's strong "zapateado" (footwork). Inspired by Shakespeare tragedy, Cruceta's Otelo took Iago as it's main character and his work reflects the reconstruction his memories. Emocional dissection of Desdémona and Othello's deaths. Jalousy, envy, frustration, anxiety, prejudice, hatred, murder. Different choreographic languages give life this crude constat of human condition and of this social-cultural broth in wich we all swim. Cruceta Flamenco with the support of " la Comunidad de Madrid y la Consejería de Cultura".